Celebrations for us Bengalis mean mishti mukh. It was Gudi Padwa, the Maharashtrian new year, a month or so back. During a phone call to didu, my granny who lives in Kolkata, I told her about Gudi Padwa. "Wow, that's nice. You get to celebrate many new years in Mumbai," observed didu happily. She got it spot on. What I love the most about my life in Mumbai is how it has helped me to connect with people from across cultures, communities and countries and, in the process, with their food too. There could be many interpretations to the 'spirit of Mumbai' no doubt, but to me its the diversity that the city offers that excites me the most. It was time for the Bengali new year too a few days back. This was not the only 'new year' happening that weekend. There was the Punjabi Vaisakhi, the Tamil Puthandu, Kannada Vishu and the Assamese Bihu being celebrated in the city too. There was a bit of ambiguity about the day on which the Bengali new year fell. Some celebrated it on the 14th of April. Others on the 15th of April. Apparently 14th was when it was celebrated in Bangladesh and 15th by Bengalis in India. There were violent debates on social media, we are a passionate race after all, about whether the correct phrase to describe the day is 'Poila Baishakh' or 'Pohela Boishakh'. The former is what I am used to and sounded more 'Bengali' to me. The latter apparently came from Bangladesh with Pohela being a play on the Urdu 'pahela' according to what I read somewhere though I can't vouch for this. This is a bit like the 'Ramzan Mubarak' (traditionally Indian) versus 'Ramadan Kareem' (apparently Arabian and more used internationally) debate. Bengalis from this side of the border, specially in Kolkata, were not happy with the use of pohela it seems and the discourse around the issue on Facebook pages was the stuff a good Bengali adda is made of. Given that I am a Bengali who has Bangal origins as my parents were born in Bangladesh, who was born in the UK, lived in Iran, grew up in Kolkata and now lives in Mumbai and is married out of the fold, I wasn't sure which side of the poila versus pohela boishakh debate that I fell in. I guess the debate turned out to be a bit redundant for me given that my Bengali new year celebrations was all about the synthesis that defines my life in Mumbai. My wife, a Parsi, bought me a lovely pink (!) shirt which I proudly wore to the food walk I conducted that morning. 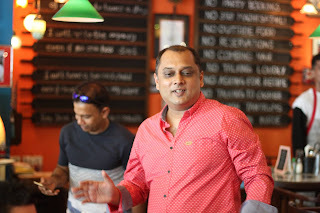 It was a Parsi food trail that I conducted for the SodaBottleOpenerWala restaurant . Our walk had a typically Mumbai group of people from all across India. There were Bengalis, Odiyas, Tamils, Punjabis, Maharashtrians, Parsis, Gujaratis, Goans, Konkanis and more. I had a Parsi brunch to start my Bengali new year. Coffee with some chocolate fudge from the Parsi run Cooper's in Lonavla before leaving home. Then Parsi poro or omelettes at SodaBottleOpenerWala at the restaurant. Irani bakery favourites such as 'batase' or butter biscuits at Paris Bakery and khari biscuits and mava cakes too. This was followed by a sampling of Parsi sweets such as the malai khaaja and the big fat jalebi and peda and mava nu boi and a much needed chilled lassi at the Parsi Dairy Farm. 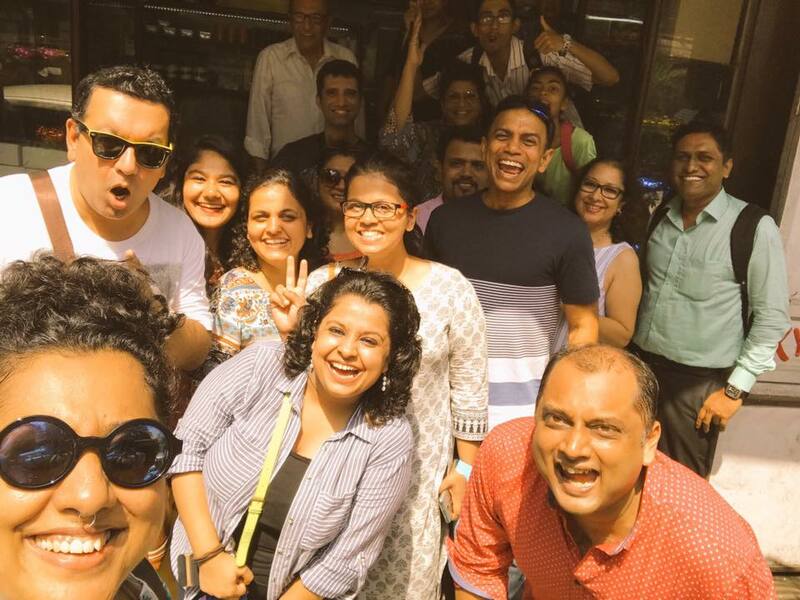 We ended the brunch at the Kyani Restaurant where we had Parsi breakfast favourites such as akoori, sali kheema and chicken pattice. I ate sparingly myself in the brunch though as I was 'saving' myself for lunch. I had ordered a Bengali Nobo Borsho thali from the kind folks at Bhojohori Manna who graciously sent it all the way to Bandra from their Oshiwara outlet as I couldn't make it there myself. I returned home at 4 pm from the trail. It was very hot outside and there was a buzz in my head after walking in the heat and my legs were feeling weak too. The sight of the Nobo Borsho feast at home cheered me up, I had a shower and then took out the food from the containers and set the table in a manner befitting the festive occasion. K suggested using a red shawl to make the table more Instagram friendly. I threw on a silk kurta over my home jammies to get into the mood. I was all set to eat when some bankers dropped home for work. The moment they left, I took pictures and shot a video of the food and then sat down to eat famished at 5.30 pm. Shukto, dal, jhuri bhaaja, chhanar dalna, echorer kaalia, shorshe ilish, bhaat, chingri malai curry, kosha mangsho, pulao, aamer chutney, chitrakut and patishapta digested, it felt like Nobo Borsho finally. At night we met our Bombay Bong friends for a Poila Boishakh dinner. People whom I got to know through my blog a few years back and with whom we have become friends since then. Some of them wanted to eat at Ling's Pavilion. Bengalis are fond of Chinese food you see. This was the second time that we had all met at Ling's on the Bengali new year. Incidentally you should not even dream of going to Ling's on the Parsi new year. The whole of Cusrow Baug takes over the place then! I was really tired when we headed our to Ling's but I was looking forward to meeting our friends. I thought I wouldn't be able to eat anything as I was stuffed from the late lunch but Baba Ling made me a nice clear soup with bean curd and glass noodles and celery on my request which soothed my taxed digestive system. This emboldened me to try a bit of the soya pork with eggs, glass noodles with rock vegetables and my favourite pan fried noodles too before we headed home. To complete my Bengali new year, I came home and had a bit of chitrakut and the brilliant chocolate walnut fudge that Freddy Mama had got us from the Parsi run Cooper's at Lonavla. 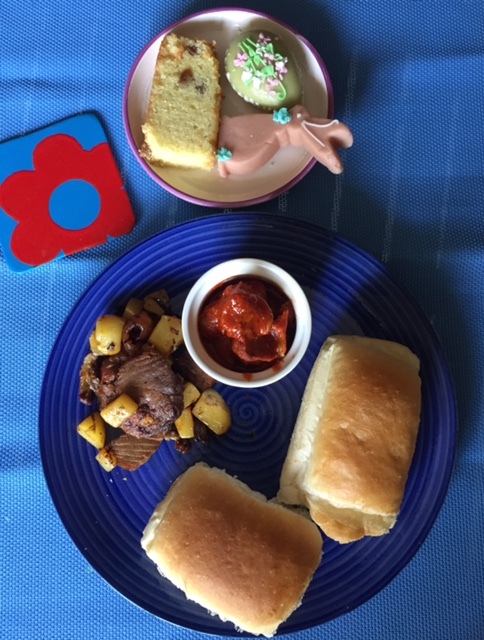 Next day was Easter and lunch was the excellent pork roast with potatoes, East Indian pork vindaloo (possibly the best vindaloo I have ever had) and Easter cake cooked and baked by June Almeida. She had thoughtfully sent me some marzipan Easter eggs and bunnies too from a local shop. June is a dear friend and neighbour who is an East Indian Catholic and whom we know through our Buddhist practise. So you could say that the plates that you see in this post sum up why I love my life in Mumbai so much. Here's wishing you a wonderful new year full of happiness and delicious food.